With one click you can add, delete and mark checklist elements as done, thanks to Ajax technology. 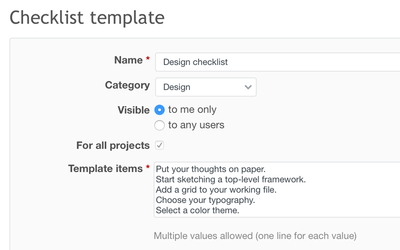 Fasten creating new issues and projects by creating and using checklist template for recurring use. 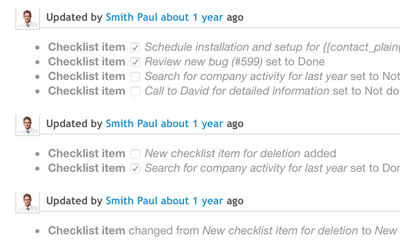 All changes made to checklist are automatically added to the issue history log. Compatible with Redmine 4.0.x, 3.4.x, 3.3.x, 3.2.x, 3.1.x, 3.0.x, 2.6.x, 2.5.x, 2.4.x, 2.3.x, 2.2.x, 2.1.x. Compatible with Redmine 3.4.x, 3.3.x, 3.2.x, 3.1.x, 3.0.x, 2.6.x, 2.5.x, 2.4.x, 2.3.x, 2.2.x, 2.1.x. Compatible with Redmine 3.2.x, 3.1.x, 3.0.x, 2.6.x, 2.5.x, 2.4.x, 2.3.x, 2.2.x, 2.1.x. Compatible with Redmine 3.1.x, 3.0.x, 2.6.x, 2.5.x, 2.4.x, 2.3.x, 2.2.x, 2.1.x. Compatible with Redmine 3.0.x, 2.5.x, 2.4.x, 2.3.x, 2.2.x, 2.1.x. Compatible with Redmine 3.0.x, 2.6.x, 2.5.x, 2.4.x, 2.3.x, 2.2.x, 2.1.x. Compatible with Redmine 2.6.x, 2.4.x, 2.3.x, 2.2.x, 2.1.x. 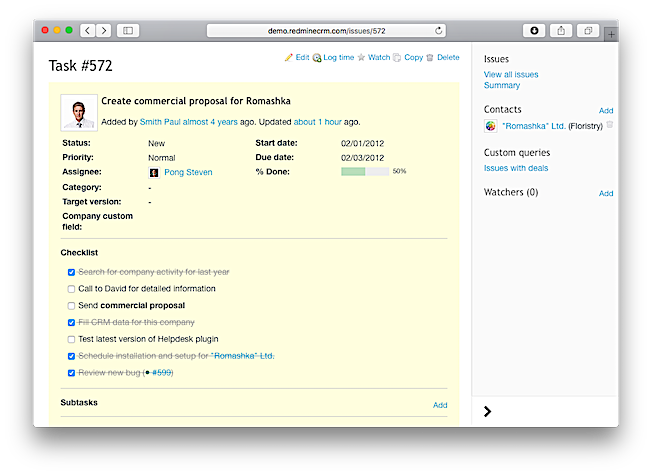 Compatible with Redmine 2.1.x, 2.0.x. Compatible with Redmine 1.4.x, 1.3.x. This plugin is a great helper tool. It drastically reduces the amount of task you have to create, if you want to guide a team member especially detailed. You can just create one task and put all the steps on the checklist. Awesome! Templates are very useful for our team. Awesome plugin! 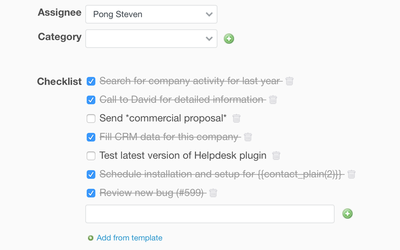 The Checklists plugin is a must use at our agency cubetech. 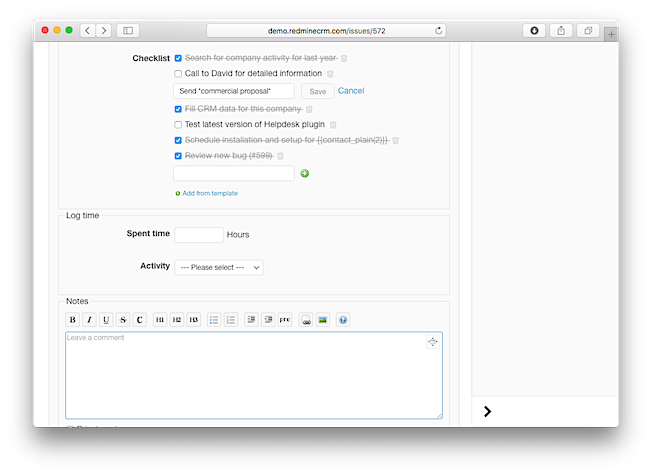 With the checklist templates it is very easy, to setup checklist for tasks like a go live of a website. Thanks RedmineUP for that awesome piece of code. My ruby is 2.3.3 and my redmine is 3.4.3. Not working with ruby 2.4.2p198 (2017-09-14 revision 59899) [x86_64-linux]. Uses deprecated methods for Rails. Much smarter than default checklists. It is great addition to our redmine, thanks. We just installed it and I already can say - very useful! Muito bom esse plugin, ajuda na organização das tarefas. Great add-in, wish it was configurable by tacker. Great plugin. I can't get my non-admin users to use it initially, but realise that you have to grant them permission to do that. All other users, if you have the same problem, check out the role's permission! Installed this plugin on Redmine 3.2.0-stable. I could see the checklist when I created an issue but failed to add any item. According to the plugin official website, it is not compatible with 3.2, which contradicts with the claim here. Screwed up my Bitnami Redmine v3.2.1. After installed and added a new checklist, Redmine showed screen saying something went wrong. Non-admin accounts can't see, therefore use checklist in tasks. Is it bug or feature? Very good easy to use plugin. If there is an issue with subissues containing checklists, checklists of subissues are NOT copied while coping the master issue! yeah, great! but italian translation is missing, in this case is it possible to load english translation? now I see "missing translation warning"
History logging is not working anymore with version 3.1.2 (light version). It would be nice that checking a box appears in the Activity tab. I haven't found any way to do it. Great plugin. Very useful to break down activities. Very Useful! A must have! Should be in core Redmine! Plugin redmine_issuechecklist was not found. One of the most useful PlugIns - btw: very Quick and friendly Support! Very useful pluging, the problem is that when copying multiple issues with checklists at the same time they are not copied :(! Nice plugin. Does its job. It is better if it can include the checklist details in each of the email notification (similar as description). I have problem with polish letters like ą, ę, etc. Is there any posibility to remove this bug? Useful little addition for some tasks which require a well defined set of steps. Such a simple idea but so convenient. nice plugin. Really helpful. Now I create lesser tickets with subtasks. 2. After check-list update should send changes only. Not raw data. Very useful plugin. Will be better if those rows in the future will be edited by ajax. Awesome plugin. Is there a way to delete the history? If people accidentally check these checkboxes, you can have a lot of unnecessary issue history. Very useful. Just I hope it would have pre-defined templates to make things very powerful. Essential plugin. No reason not to add this to your server. 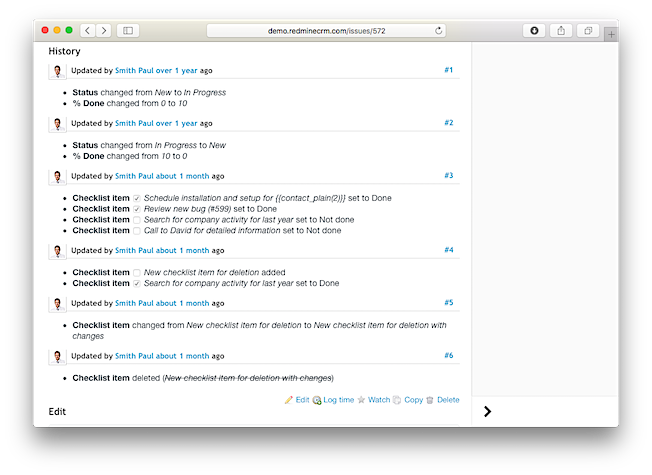 Now we have To do list on Redmine tracker. Thanks.